One of the girls who met R/K at the movies saw them last night at dinner. "Met Robert Pattinson again last night and saw Kristen Stewart while we were having dinner. 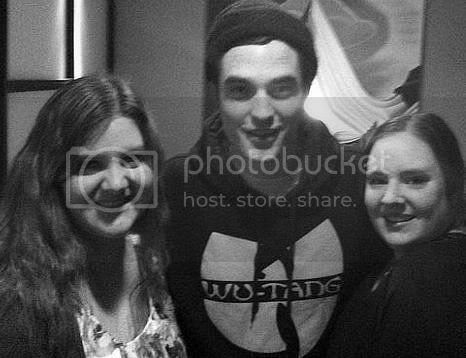 Didn’t get a chance to talk to her, but talked briefly to Rob and he was SO nice." "They were in a group together.. I don’t really want to say the restaurant because I do respect their privacy but it was in Squamish. We were sitting beside them for about 4 hours or so and let them be as I’m sure they are sick of being harassed. Then as we were leaving we bumped into him on our way out and he allowed a picture to be taken with him. He was incredibly nice and down to earth." Rob and Kristen Spotted in Vancouver Tonight? Rob Confirms Vampire Caesarean in "Breaking Dawn"
Full Robert Pattinson on MTV interview! Livestreams for Rob on Jay Leno tonight! New 'On The Road' Still! Holliday Granger Talks About Rob & "Bel Ami"